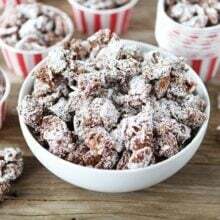 Toasted Coconut Kettle Corn-sweet and salty kettle corn made with coconut oil, toasted coconut almonds, and coconut chips! 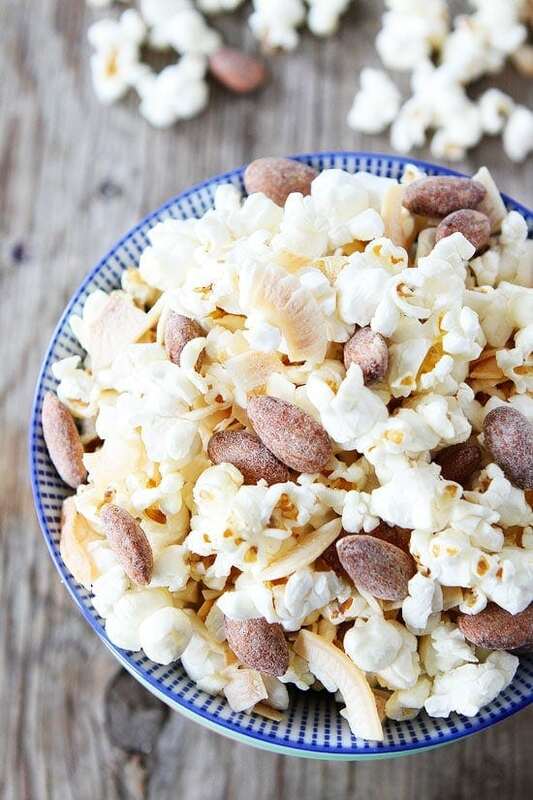 Coconut lovers will go crazy for this popcorn! Last weekend, Josh was popping up Kettle Corn for game day and I put in a special request. I asked if he could make Toasted Coconut Kettle Corn. I told him I would help with the add ins if he would pop me up a mean batch of Kettle Corn! I don’t dare touch his precious popcorn popper. That is his territory:) He was happy to make me a batch so I got out of the way and let him work his popcorn magic. He’s got it down! Josh uses coconut oil to make his famous Kettle Corn. I thought it would be fun to kick the coconut flavor up a notch by adding toasted coconut chips and Blue Diamond’s Toasted Coconut Almonds. 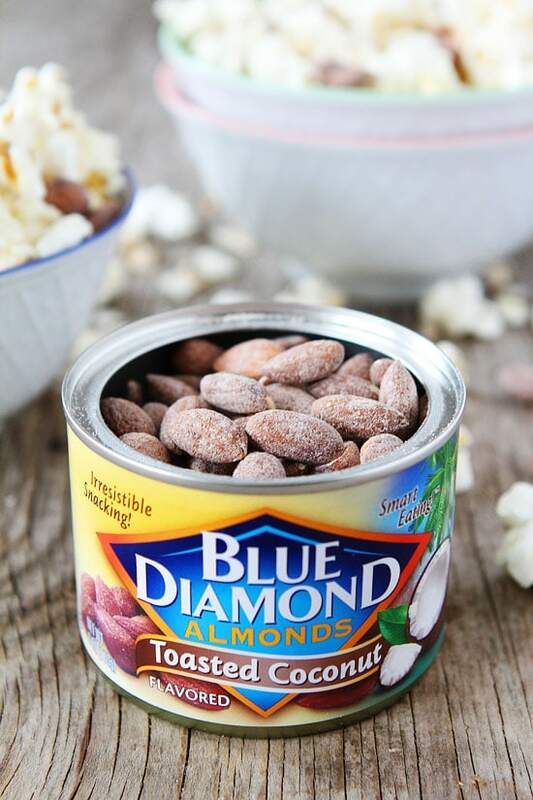 Have you tried Blue Diamond’s Toasted Coconut Almonds? They are my current obsession. I eat a handful almost every day. 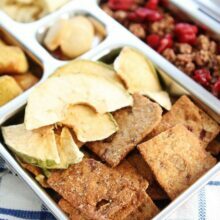 They are a great healthy snack and are helping take away my winter blues. The sweet coconut flavor transports me to a tropical beach every time! 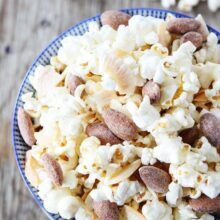 The Toasted Coconut Almonds are a perfect addition to my sweet and salty Kettle Corn! They add a nice crunch and delightful coconut flavor. Coconut lovers will go crazy for this Toasted Coconut Kettle Corn. And if you can’t find coconut chips, you can use regular toasted coconut. 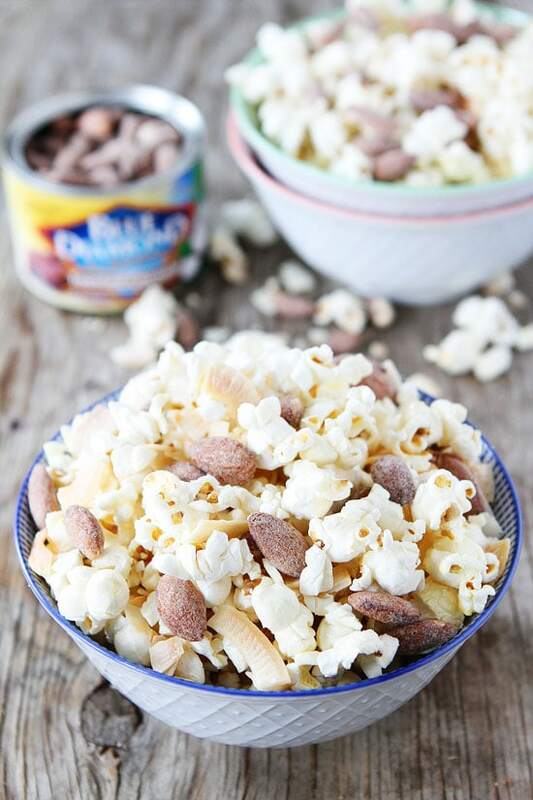 Just toss all of the ingredients together after the Kettle Corn is done popping and you have a big bowl of coconut deliciousness! I already put in another request for Toasted Coconut Kettle Corn. Josh knows he is on Kettle Corn. This is the perfect Game Day snack! Pop up a batch for your guests to enjoy! 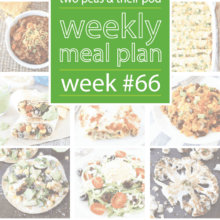 And you might want to make a double batch so you can save some for snacking during the week. You never know when you will need to visit that tropical beach! Just close your eyes and grab a handful of Toasted Coconut Kettle Corn and you will feel the sand between your toes and the sunshine on your face! Enjoy! 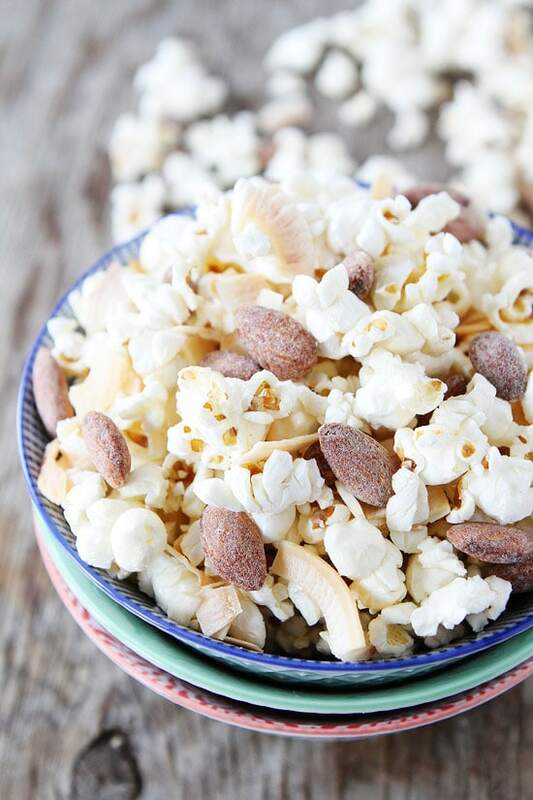 Sweet and salty kettle corn with toasted coconut chips and toasted coconut almonds! A great snack for game day, movie night, or every day! 1. 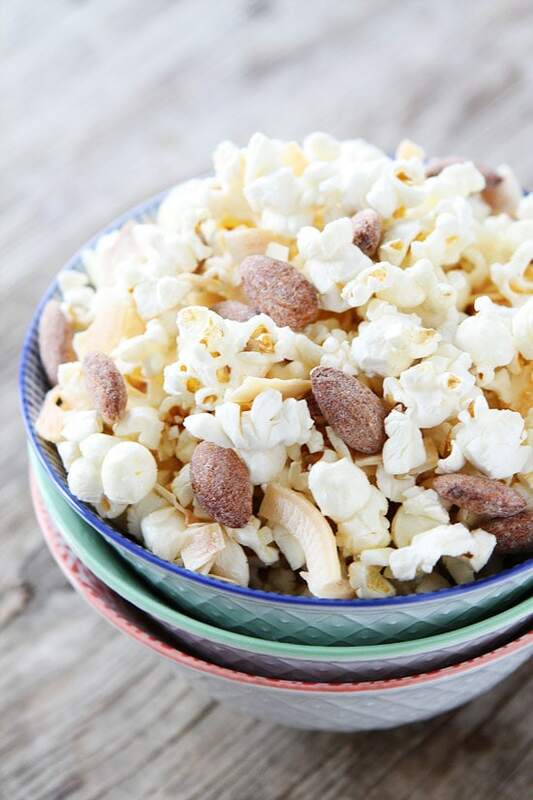 In a Whirley Popcorn Popper or in a large pot with a lid, heat the coconut oil over medium-high heat. Add the popcorn kernels. When the coconut oil sizzles, sprinkle the sugar over the popcorn kernels. Cover and stir or shake the pan until the popping slows down. The popcorn should be done popping in about 2 minutes. Remove from the heat and pour the kettle corn into a large bowl. Sprinkle with salt and toss. Add the toasted coconut chips and Toasted Coconut Almonds. Enjoy! Note-the kettle corn will keep for 2-3 days. Store in an air-tight container or Ziploc bag. If you can't find coconut chips, you can use regular coconut. I buy toasted coconut chips at Whole Foods. If you use regular coconut and want to toast it, Preheat oven to 325°F. Spread coconut flakes on a large baking sheet. Place in oven and bake 5-10 minutes, stirring occasionally. Remove from oven when coconut is light golden brown around the edges. Disclosure-this post is in partnership with Blue Diamond Almonds, but our opinions are our own. Thank you for supporting the brands that continue to make Two Peas and Their Pod possible. For more Game Changing Snacks, visit Blue Diamond Almonds on Facebook, Instagram and Twitter. Hmmm, I don’t have a Whirley popcorn popper, or any popcorn popper but have been making popcorn in my Dutch Oven of all things when I got desperate. I think I could probably still do this recipe in there and it would still work?! I love coconut!!! And Blue Diamonds. Seriously in addiction counseling over their salted almonds, they are crunchy like no other almonds on earth. They’re just like that! You just blew my taste buds right off my face. I am OBSESSED with kettle corn and coconut, but have never thought to put them together. And that almond crunch? Snackage perfection! Pinned! Droooooooling! And now I know what I’m making tonight for movie night, thanks! I am a HUGELY obsessed kettle corn fan. Add coconut to that stuff? You are brilliant. I’m going to have to try this recipe tomorrow when I’m snowed in. DIVINE! Coconut everything 🙂 And yayy popcorn!! Total love! That’s my flavor of popcorn for sure. Anything with coconut…count me in. Well I’d say you two make a pretty great team because this look AMAZING! I want to eat the whole batch by myself! this is a flavor combo I love, but never thought of putting with popcorn!! sounds amazing Maria!! What a perfect snack!! Happy Friday!! this is right up my alley! looks great Maria! Coconut popcorn sounds delicious! Add in coconut almonds and this is over-the-top good! I am new to using coconut oil. Just learning about it. I know there are different kinds, what Coconut oil do you use for the popcorn? Most stores carry coconut oil. We like Trader Joe’s brand. 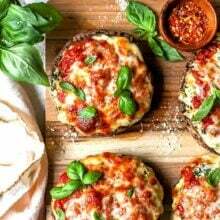 I love the use of coconut oil in this recipe! This looks like another fun use for coconut oil. What a fun flavor of popcorn! Pinning for yummy future snack! I haven’t seen those almonds. I am a huge coconut fan so I know I would love them. And this popcorn. Oscar snack for sure! I am wishing I had this beside me right now to snack on! Kettle corn is the bomb! I love your idea to add all those layers of coconut! Oh my goodness. I adore coconut! Imma have to get some of those almonds! Sounds delicious!! Oh man my daughter and I just made this popcorn and can’t stop eating it yum!! Oooooooo…wonderful way to eat popcorn!! This sounds so good! I wanted to make it for Super Bowl but having trouble finding the coconut almonds. Anyone else? May try to find them online. Why have I not tried the coconut almonds?? They sound amazing!! I used Coconut Sugar from The Spice & Tea Exchange, yummy!